Children will be given conkers to use in the British Junior Championships amid fears that allowing them to use their own may lead to cheating. The event, to be held at the Blackgang Chine theme park on the Isle of Wight on Sunday, has been "dogged" by controversy over doctoring in the past. The conkers can be baked or soaked in vinegar to make them harder. Youngsters will also be given protective goggles. 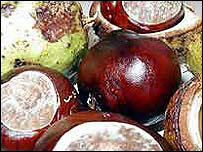 In Northants 320 adults will compete in the 41st World Conker Championships. In 40 years we have never had any injuries through conkers. The whole world has gone crazy these days, in my opinion. Hugh Dinsdale, retail manager of Blackgang Chine, said: "To avoid any possible conflicts this year we have decided to provide the conkers and strings. "We have collected our own conkers from a couple of good known areas on the Isle of Wight. "They are just as if they have fallen from the tree." In 1993 ex-Monty Python star Michael Palin was disqualified from an adult competition on the island for baking his conker and soaking it in vinegar. Following concerns about health and safety raised in recent years, competition organisers will provide goggles for children to wear if they want. Last October, Shaun Halfpenny, head of Cummersdale Primary School in Cumbria, bought his pupils goggles to wear when playing conkers after concerns were raised about safety. Peter Morris, the 41st Annual World Conker Championships competition secretary, said safety goggles would be on sale for those taking part. "In 40 years we have never had any injuries through conkers. The whole world has gone crazy these days, in my opinion. "There is absolutely nothing wrong with playing conkers. I would advise any child to have a bit of fun but be careful and be sensible." On Saturday, a group called the Campaign for Real Conkers urged people to boycott of the World Conker Championships, claiming the event was "contributing to a decline in interest in playing conkers". Keith Flett, the organisation's spokesman, said: "The emphasis on conker playing as a regulated sport where some play and others watch is not welcome."